GlobalSCAPE, which specializes in information exchange solutions for enterprise customers, this morning announced that it has acquired TappIn, maker of an eponymous cloud-based file access and sharing solution. TappIn, formerly known as HomePipe Networks, was picked up for $9 million in cash, though shareholders stand to receive another $8 million if certain performance-based milestones are met over the next three years. 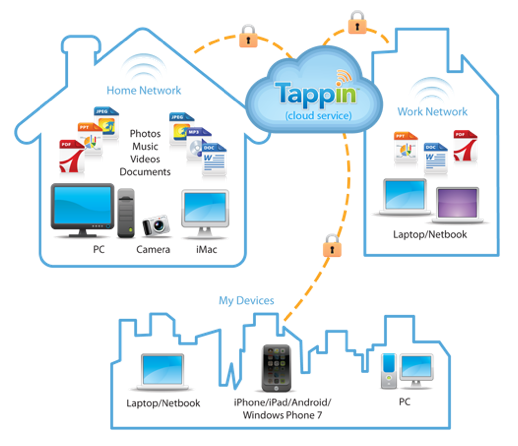 TappIn basically lets you access any files (documents, images, videos and whatnot) stored on your computers, external hard drives or other storage devices from any Web browser or modern smartphone – the service supports iOS, Android and Windows Phone 7. Unlike services such as Box and Dropbox, TappIn lets you access digital content without to need to upload or sync said files. There are obvious security risks involved with that approach, but TappIn claims all content gets compressed and encrypted before it is accessed from another device than the one it is stored on. Founded in 2009, TappIn will a wholly-owned subsidiary of GlobalSCAPE, and all the company’s employees – including executives Chris Hopen, Parvez Anandam, Doug Wheeler, and Andrew Tull – will remain in its hometown of Seattle.